Ringo Starr and His All-Starr Band will perform at Greenville’s Peace Center on February 17. Though most famous for his role as drummer in The Beatles, Ringo Starr been recognized as a premier musician in his own right, both as a soloist and as a collaborator with other artists. He’s been inducted into the Percussive Arts Society Hall of Fame, will be included in the Rock and Roll Hall of Fame this year, and was named 5th greatest drummer of all time by Rolling Stone. The All-Starr Band is a collaboration of several successful musicians, including Steve Lukather of Toto, Gregg Rolie of Santana and Journey, and Richard Page of Mr. Mister, along with several others. The All-Starr Band’s performance in Greenville is part of an international tour that also includes concerts in the Dominican Republic, Brazil, Argentina, Columbia and Chile. You can learn more about this event on the Peace Center website. 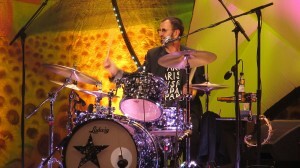 Photo credit: “20110626 043 All-Starr-Band-in-Paris Ringo-Starr drums WP” by Jean Fortunet – Own work. Licensed under CC BY 3.0 via Wikimedia Commons.